The Foma Fomaspeed Liquid Emulsion 1 kg + Hardener 15 ml is a chemical for use in photography under RED safelight conditions. 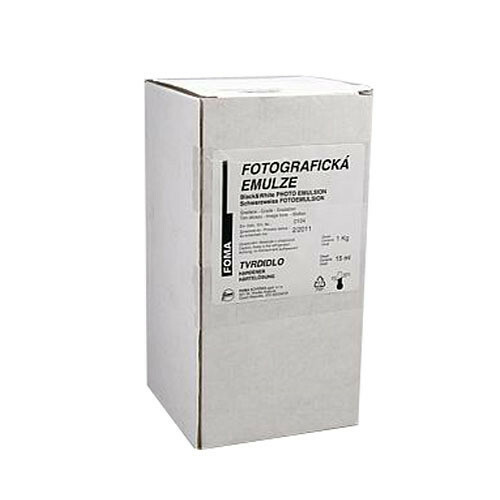 For amateur and professional photographers alike, Fomaspeed Emulsion features medium contrast and extremely high covering power which allow you to gain a broad scale of halftones - even by a relatively high yield of 32 - 64 sq ft (3.0 - 6.0 sq m) per 2.2 lb (1.0 kg) of emulsion. For most common applications, especially on smooth surfaces, one layer of emulsion is enough to be spread. One main advantage of this high-speed emulsion is short exposures, which enable large-size enlarging. With most developers, this emulsion produces a neutral to mildly warm image tone. The emulsion may be spread on many different bases, including wood, textile, glass, china, ceramics, metals, leather, stone, concrete and plaster. The photochemical inactivity of the base is crucial. If this condition cannot be met, the base should be treated with a suitable waterproof layer, such as epoxide varnish. Good wetting power of the base surface is also important to the process. Non-wettable surfaces should be treated with a suitable preparation layer before spreading the emulsion, in order to ensure good coherence of the emulsion to the base. Features medium contrast and extremely high covering power which allow you to gain a broad scale of halftones - even by a relatively high yield of 32 - 64 sq ft (3.0 - 6.0 sq m) per 2.2 lb (1.0 kg) of emulsion. For most common applications, especially on smooth surfaces, one layer of emulsion is enough to be spread. May be spread on many different bases, including wood, textile, glass, china, ceramics, metals, leather, stone, concrete and plaster. Photochemical inactivity of the base is crucial. If this condition cannot be met, the base should be treated with a suitable waterproof layer, such as epoxide varnish. Good wetting power of the base surface is also important to the process. Non-wettable surfaces should be treated with a suitable preparation layer before spreading the emulsion, in order to ensure good coherence of the emulsion to the base. One main advantage of this high-speed emulsion is short exposures, which enable large-size enlarging. With most developers, this emulsion produces a neutral to mildly warm image tone. Supplied with the emulsion, the hardener ensures good mechanical resistance of the layer spread, and is recommended for all applications. The correct proportions are those supplied, i.e., 15 ml with 1.0 kg of emulsion. Suitable hardeners can also be used, e.g. formaldehyde (1.0 to 5.0 ml of 10% solution per 1.0 kg of emulsion), or in combination with the same volume of chrome alum solution (10%). Due to a high silver content and a relatively thick layer when spreading the emulsion manually, energetic developers are recommended for use, e.g. Fomatol LQN and Fomatol P from Foma. To effectively stop the development, Fomacitro citric acid-based stop bath is suitable, while for fixing, Fomafix fixer is recommended. Corresponding processing chemicals of other manufacturers can be used. Box Dimensions (LxWxH) 8.5 x 4.7 x 4.4"
Fomaspeed Liquid Emulsion 1 kg + Hardener 15 ml is rated 5.0 out of 5 by 1. Rated 5 out of 5 by Sasha from Good normal contrst emulsion I use it a lot while printing on cellulose papers like Hahnemuhle Torchon, Canson Montval Torchon, Goznak. But personnaly recommend to dilute it with water 1:1 and cover the paper twice giving it get dry between covering. It is includes hardener but it is unnecessary. With these paper this emulsion works fine without it. Here is some examlples made with this emulsion:http://skrasnov.com/tag/liquid-light/ The emulsion yields very good covering capabilities.